The week after the launch of Talk About Touch, the Village of Akiak, Alaska, invited Sandra Kleven to keynote their annual Education Summit. Kleven also signed books at the Bethel Library and met with many local leaders. She was interviewed on KYUK radio. Talk About Touch was published in 2012 by Illumination Arts, Inc. This company has a history of prevention work as publisher of The Right Touch, in 1998. The Right Touch was Kleven's first book on the topic. Talk About Touch was launched at the Children's Maltreatment Conference. The Alaska Children's Alliance hosted a reception in a large suite on the 16th floor. The City of Anchorage spread out below through floor to ceiling picture windows. Sponsors were recognized and congratulatons shared over long effort now a reality. Two corporate sponsors are helping to lead the way toward a state-wide prevention campaign that will coincide with the release of the book. Alaska's Children's Alliance provided the first large commitment to the project. ACA is an association of Alaska's ten Child Advocacy Centers. These organizations are involved with the forensic interviews that follow an allegation of sexual abuse. They are scattered geographically across the state. They are the heart of the services statewide that work to protect children from sexual abuse. This generous donation was followed by a commitment from the Yukon-Kuskokwim Health Corporation, to send Talk About Touch to every tribe and school library of the Y-K Delta. The books will be sent with prevention materials. As plans evolve, training in the villages may be offered. All efforts will coordinate with Governor Sean Parnell's "Choose Respect" campaign, now leading the way in efforts to end domestic violence and sexual assault. Sponsorship on a personal and corporate level is still being solicited. Specific goals are being developed that will multiply the impact of every dollar given. In January of 2012, Kleven was twice nominated for a Pushcart Prize. The nominations are based on poems published in Stone Boat in Sheboygan, WI and in F-Magazine of Anchorage, Alaska. Today Patrick delivered the second to last illustration. He is now working on the final picture with dad and son on the snomachine, heading to grandma's house. Sugar, the dog, is riding in the sled and howling like a wolf. We have set a target date of February 14, 2011 for the launch of TALK ABOUT TOUCH. Our list of sponsors has grown to eight. Today we added Beth Weltner. I know the rest from memory. Thank you. We are past half-way because of you. For a fundraiser, I have created a magnet the size of a business card. It has the first picture, "Dad and son at the table" and it says, "Say no. Get away. Tell someone." I am offering these for $2. I can probably mail with first class postage - so $2.50 for a single magnet. I'll work on both a larger magnet and a poster but most of all, consider sponsoring or donating so we can continue at a brisk pace. Cards on table - one illustration is $100 to Patrick Minock and I am paying as we go. Vivian's donation detailed below has allowed me to pick up steam. Between the donation and my own out of pocket we will have the next five pictures down. That will mean nine of the needed sixteen. I am happy to send the entire manuscript to any who ask and may be able to add it to this page via link. I will add the magnet. Patrick took the bus across town to deliver, first the "falling through the ice drawing and then, just days later, he arrived with grandmother giving Oscar a bath. This is how it happened with THE RIGHT TOUCH. I told the illustrator what I saw in my mind, and she could produce it. She could see what I envisioned and had the talent to get it on baby - and, as with Patrick surpassing the image in my head - several times over. WE are four illustrations into the project. We've been at a standstill since June. Then in July we were able to move ahead, thanks to Vivian Faith Prescott. Vivian is a recipient of the Jason Wenger Memorial Award. Jason was a student in the Creative Writing MFA Program. He was murdered in December of 2006, by a troubled strange, who shot him while he was warming up his car one morning. He was my friend. The UAA Low Residency Program in Creative Writing award several students each year from a fund set up as a memorial. Vivian was one of three students selected this year. I recieved an email a few days later. 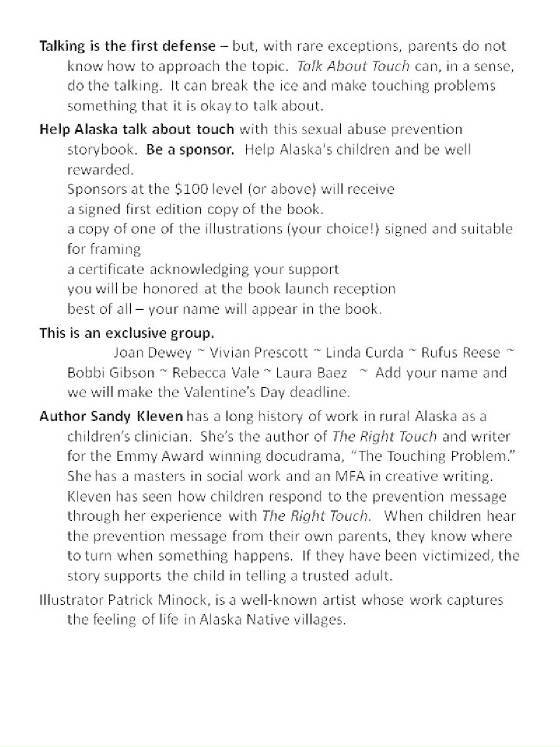 Vivian wrote to say she was giving half the award to support Talk About Touch: Alaska a book for children that I am struggling to get into print. I am working with the wonderful native artist, Patrick Minock and stay current with him paying him the price he deserves for every drawing. With this money, we will have eight of sixteen drawings completed. See some of the first drawings, here. I am writing to express my appreciation at receiving the Jason Wenger Award. I am honored and proud to be stand with the others. 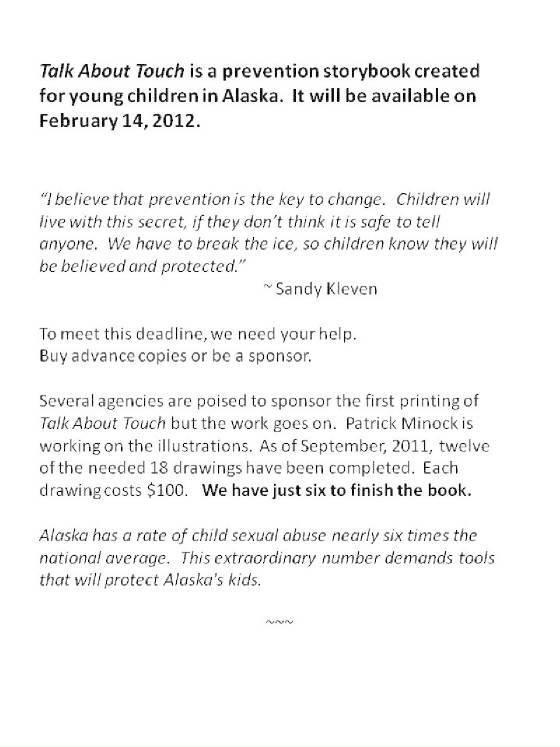 I've decided to donate half of my Jason Wenger Award money to the children's book Talk About Touch: Alaska being developed by program graduate, Sandy Kleven. The money will help with the cost of the illustrations. I want to make this donation an extension of the Jason Wenger Award, reaching further to do good in the world as Jason would have done. I also want to communicate how important it is to support our fellow MFA students. This award was created response to a tragedy to assure that Jason’s memory was associated with recognized literary achievement. Passing on a part of the award to this high purpose – the prevention of child sexual abuse – seems yet another worthy expression. from a village on the Yukon. drawing for the first time. to bring the words to life. Seventy-five individuals and organizations have expressed interest in supporting this project. They will help us carry this project through its birthing... as a book in hand, a book in homes, throughout Alaska - and in other Indigenous communities. We are raising money to pay the artist and to 1) propose the project to an agency or publisher; 2) Or do an on demand web-based publication. Whatever the final choice, Talk About Touch will be in the hands of the reader, within the year. which will include the whole family. Picked up the fish camp illustration. Received donations from Joan Dewey and Linda Curda of Bethel. The forth illustration was finished. The dog, "Sleepy" under the table. I am in a holding pattern waiting for decisions about sponsorship from Tundra Woman's Coalition and Alaska Native Justice Center. Patrick calls every few days to check but I can't ask for more drawings until I have some support from the community. Below, find a representation of the original format for the story. Since the 1980's, this tool for sexual abuse prevention has been available in a four page, 8.5 x 11 format, printed on card stock. More than a thousand copies have been sold and several regional health corporations have purchased the rights to reproduce it in their regions. This is the problem -- TALK ABOUT TOUCH is a story for young children -- ages 3 -- 8. There is too much text unsupported by pictures to adequately engage young children. It was originally written to be published as a story book, but to date, this is the only version available. Since finishing my MFA in Creative Writing, I have been able to re-double my efforts to 1) find the right illustrator and 2) to find the right publisher. In this case, the illustrator holds a key to captivating the right publisher. The development fund for TALK ABOUT TOUCH will assure that the illustrator is paid as the work is produced. If no publisher steps forward, then it will be a relatively easy step to publish the book independently. 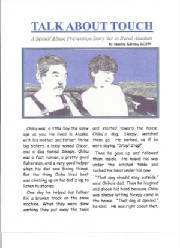 Talk About Touch is sexual abuse prevention story set in a Native village. A native father talks to his son about touching problems and what to do if anyone tries to touch him in ways that make him uncomfortable. The situation is applied to girls as well. The father gives examples of other unsafe situations and helps the child understand that his warning feelings will help him to be safe. Examples are given of times when such touching is okay -- such as when changing a baby's diapers. But if there is no good reason, the father advises his child to get away from the situation as soon as they can and tell a trusted grownup about what happened. This story was written in 1985. It has been reviewed by experts in the field and by the cultural experts of Alaska -- the Native people themselves. Several thousand copies have been distributed throughout the state since then. Several regional organizations have purchased the reproduction rights to Talk About Touch (some under different names as we worked to find one that avoided confusion with other publications). As the author of this story, it is my goal to see it published in a multi-page format - a picture book - published independently or with a motivated publisher. The issue is great concern in Alaska where the number of children sexually abused far exceeds that of other states. If you would support this transformation, please consider a donation or sponsorship. Meanwhile, I will continue to offer limited rights to reproduce, Talk About Touch, in the original four page format. $100 is the charge. All such payments support the development of the picture book version. Sandy Kleven is also the author of The Right Touch: A Read-Aloud Story to Help Prevent Child Sexual Abuse. This is a 32 page, large format, hard bound book with full color illustrations by the artist, Jody Bergsma. Copies of The Right Touch, signed by the author, are available for $15.95.